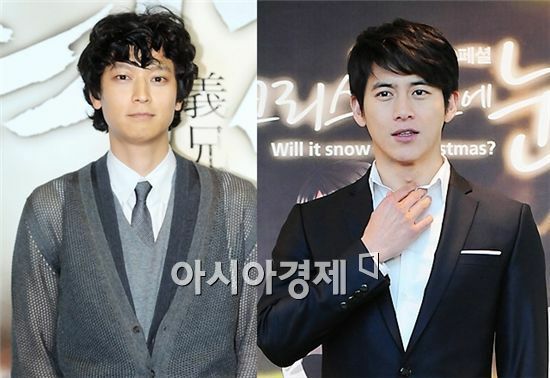 Top Korean actors Gang Dong-won and Go Soo have become the main cast of a new action thriller tentatively titled "Haunters", according to movie producers Zip Cinema on Monday. Kang will play the role of a mind-controlling psychic who tries to lead an ordinary life until he meets Kyu-nam, played by Ko, who is not affected by his supernatural powers. The movie will be helmed by director Kim Min-suk-IV who has won the award for his film "Memories of Oldboy" at the 2004 Mise-en-scene's short film festival under the action category. He was also the assistant to famed directors Bong Joon-ho and Kim Jee-woon. Kang made his debut in the entertainment industry in 2003 appearing in several dramas but rose to fame after his role in the hit movie "Temptation of Wolves". He has starred in other movies such as "Duelist", "M", "JEON WOO CHI : The Taoist Wizard" and most recently in the action movie "Secret Reunion". Ko appeared in the music video "Letter" by singer Position in 1998 and has since added numerous dramas and films to his resume. His most memorable appearances include dramas "Piano" and "Will It Snow for Christmas??" and movies "Some" and "White Night". Kim Tae-hee, Lee Joon-gi to star in film "Grand Prix"